As THM Carbones partner we offer all THM products as a custommade ETOE Version. You would like to order your individual THM Product? We create a coloured custom version that fits your bike. Let us know your ideas! The Clavicula sine exceptione shifts the standards of THM-Carbones. Experience a new way of crank construction. For the initial use on racing bikes chain rings are available with 130 mm or 110 mm diameter bolt circle. 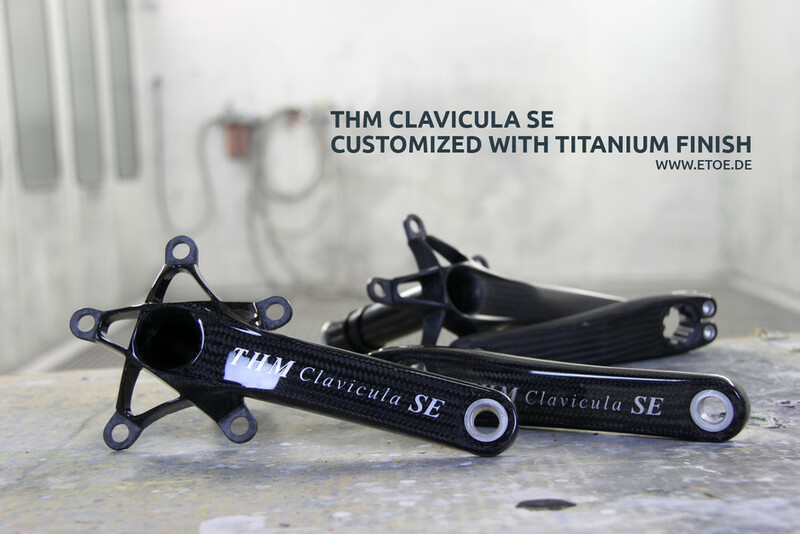 All current bottom bracket systems are usable which means the Clavicula SE will practically fit any type of frame. The crank set is coated with the ETOE Supreme Coating. The few µm thick coating protects the crank set from environmental influences, UV radiation and yellowing. Inner width of the cranks: 118 mm max.